The Department of Juctice (DOJ) and the Federal Bureau of Investigation (FBI) of the United States will now formally track hate crimes against Sikhs, Hindu and Arabs, following years of lobbying by pressure groups from the communities. After years of lobbying by community advocates and the support of 140 members of Congress, the DOJ and FBI have updated their hate crimes database and the FBI Hate Crime Data Collection Guidelines and Training Manual. Previously, no federal statistics were kept on hate crimes against these groups, according to one news report. The FBI document is considered the sin­gle most impor­tant and inclu­sive hate crime train­ing resource avail­able for law enforce­ment officials, according to a statement by the Sikh American Legal Defense and Education Fund (SALDEF). The ver­sion of the document now includes a spe­cial con­sid­er­a­tions sec­tion to help local police offi­cials effec­tively iden­tify and report the new cat­e­gories of crime man­dated for col­lec­tion in 2015 – includ­ing hate crimes directed at Sikhs, Arabs, and Hin­dus, the statement added. “We encourage the FBI to continue to improve the manual and law enforcement training to ensure appropriate classification of crimes where a Sikh is targeted for his or her articles of faith,” it said. The release of the updated Hate Crimes Tracking form and manual will ensure ‘accurate reporting of hate crimes committed against Sikhs, an important step that will ultimately aid the Sikh community as we continue to address the roots of anti-Sikh bias, said SALDEF executive director Jasjit Singh. 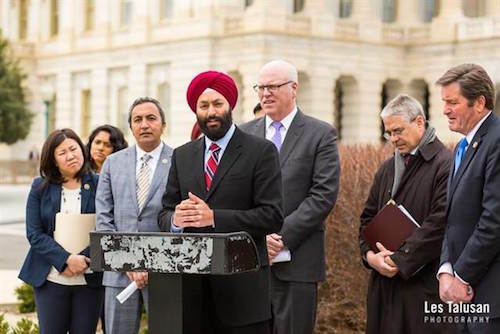 “Sikh, Muslim, Hindu, South Asian, and Arab Americans have disproportionately faced senseless violence motivated by hate in recent years,” he added. Rep Colley described himself as one of them who spearheaded the effort to encourage the Department of Justice and FBI to begin tracking and quantifying hate crimes against Sikh, Hindu, and Arab Americans, according to one of his releases in 2013. One of the triggers that hastened the FBI tracking was the attack on a Wisconsin Gurdwara in August 2012 by a gunman with ties to a white supremacist organisation that killed six people. 1. An assailant ran by a Sikh pedestrian, shoved him to the ground, forcibly pulled his Dastaar (Sikh turban) and said, “Take that thing off your head–we don’t want your kind in this neighborhood!” In the process of the attack, the victim suffered a concussion. When law enforcement responded to the scene, a witness to the attack recognized the offender as a clerk at a local convenience store near a predominantly Sikh community. Offense–Aggravated Assault. This incident should be reported with an Anti-Sikh Religious Bias because the evidence indicates the victim was targeted due to his Dastaar and the assailant’s ongoing dealings with the Sikh community. 2. A vandal defaced a Gurdwara (Sikh House of Worship) with graffiti using well-known and recognized Sikh epithets. Offense–Destruction/Damage/Vandalism of Property. This incident should be reported with an Anti-Sikh Religious Bias because the evidence indicates the Gurdwara and its congregants were targeted because of their religious affiliation. 3. One teen walked up to a Sikh teen in the school hallway and said, “I’m going to cut your hair! The Sikh teen replied, “For what? It is against my religion to cut my hair!” The assailant replied, “I don’t care,” and later snuck up behind the Sikh teen and cut the victim’s hair. Offense–Simple Assault. This incident should be reported as Anti-Sikh Religious Bias since the evidence indicates the victim was targeted because of his kesh (unshorn hair). Exercise 11: An adult assailant ran by Mr. Singh, an elderly Sikh pedestrian, shoved him to the ground, forcibly pulled his Dastaar (Sikh turban), and said, “Take that towel off your head–we don’t want your kind in this neighborhood!” In the process of the attack, the victim suffered a concussion. When law enforcement responded to the scene, a witness to the attack recognized the offender as a clerk at a local convenience store near a predominately Sikh community. Reasons: The evidence in the incident indicates the victim was targeted because he was wearing a Dastaar. The facts uncovered in the above referenced investigation (e.g., the assailant had dealings with the Sikh community) indicated the assailant’s motivation was directed at the victim because he was Sikh.